Bassari Country: Bassari, Fula and Bedik Cultural Landscapes represents an isolated, multicultural society of traditional communities. The site includes three geographic areas with a mix of Bassari, Fula and Bedik peoples. They live in agricultural villages that were settled by several waves of migrations from probably the 11th-13th century on. The villages are located in a hilly, difficult to access landscape. This inscription contains three parts: Bassari (Salemata village as a starting point), Bedik (Bandafassi) and Fula (Dindefelo). The closest to the city of Kedougou is Bedik Bandafassi which in my opinion is the most interesting – some small villages on the top of the mountains, with only 3000 people living there. It’s good to visit at least three, four of them but you need one day of very intensive walking and a guide because they are not easy to find. It is not a tourist trap and the Bedik people are very friendly. Just give some money to the chief of the village and walk freely, take as much pictures as you want. Bedik speak their own language, belonging to Niger-Congo family and has some similarities with some Tenda group languages. Their religion is a blend of animist and Christianity, and their most important village – Iwol. The Bedik came here possibly in the 18th / 19th centuries from Mali, and most of them bear Keita as their family name. 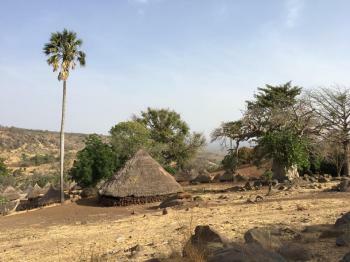 Most of their original villages are deserted now because of the lack of water. Bassari country with Salemata as a starting point is commercialized as no other place in Senegal. It is strange because no many tourist coming here. Here you have to pay for everything: visiting villages, taking pictures, local guides, local chiefs… If you can pay 50 Euros they can arrahne a traditional ceremony just for you! 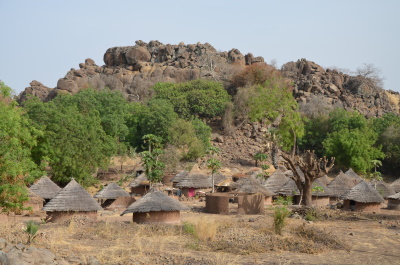 It is located around 80 km from Kedougou but it takes around 3 hours to get there using the sept-places old Peugeot; and there is only one vehicle a day, except Thursday, market day. I was a bit disappointed and tired after a day there… Of course, the local architecture and traditions are very interesting. Be sure that you do not miss your transport back to Kedougou! If you want to hire somebody from the village you’ll have to pay something like 80 euros!!! On National Border: Location 001 - Bassari Salémata borders Guinea to the South. 9 Community Members have visited.